Explore the history of Hampstead Hill in our online exhibit on the history and archaeology of Patterson Park. In the early 1800s, Hampstead Hill (located within Patterson Park today) was the site of Baltimore’s major defensive position against a British land invasion in the War of 1812. In the fall of 1814, British forces mounted a two-pronged attack on Baltimore. The British navy lay siege to Fort McHenry while land forces marched on Baltimore after landing in the area of North Point 20 miles to the east. With short notice, Baltimoreans prepared a tremendous defense position against the land invasion along Hampstead Hill. The preparations included digging extensive trenches, creating earthen berms, mounting cannon, and stationing upwards of 20,000 troops to meet the British forces. Baltimore’s defense was successful at both Ft. McHenry and Hampstead Hill and the Battle of Baltimore was a turning point that led to the United States’ victory in the overall War of 1812. This history is adapted from Scott S. Sheads research on the history of the Rodger’s Bastion. Learn more about our We Dig Hampstead Hill project or continue reading for the full history. Excerpt from Warner & Hanna’s Plan of the City and Environs of Baltimore, 1801. Johns Hopkins University Sheridan Libraries. As early as 1807, Hampstead Hill had become rendezvous site where local militia convened to celebrate Washington’s birthday, the Fourth of July and other occasions. The hill overlooking Fell’s Point is still one of a series of low ridges that start as north as New York state and come south, paralleling the Jones Falls to the harbor. Hampstead Hill likely took its name from London’s Hampstead Heath, a large public green that dates back to before 1086, just as Baltimore’s Fleet Street and Thames Street have their own British counterparts. In 1792, local merchant William Patterson bought the 200-acre Harris Creek estate from at auction for $8,500. Born in Ireland, William Patterson immigrated to Philadelphia in in 1766 at age 14. Patterson worked as a shipping agent for the British government before the American Revolution but earned a fortune importing arms and ammunition from France for the Continental Army during the war. When Patterson moved to Baltimore in 1788, he invested half of his considerable fortune in local real estate including the land around Hampstead Hill. 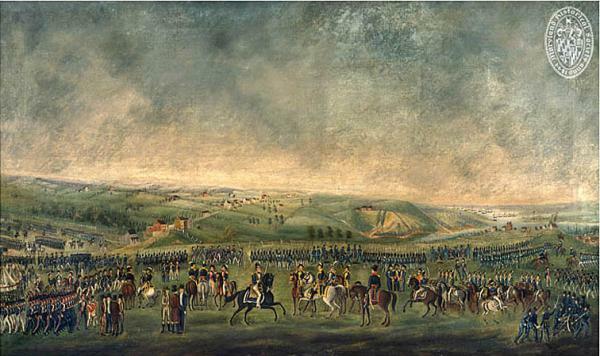 “Assembly of Troops Before the Battle of Baltimore,” Thomas Ruckle Sr., ca1814. Maryland Historical Society, 1879.2.1. As the British approached, the length of the entrenchments and redoubts upon Hampstead or Londenslager’s Hill stretched over a mile from the waterfront Sugar House in Fell’s Point near Harris Creek, northward to the Belair Road. The arrival of Commodore John Rodgers naval brigade from Philadelphia on August 26 of 350 U.S. Marines and sailors from the frigate Guerriere gave the city hope of a defense. Around this corps of veteran naval veterans, Major General Samuel Smith gathered the 15,000 arriving militia from Delaware, Pennsylvania, Virginia and Maryland. These troops gave support to the train of thirty-four field guns that crested the defense lines upon Hampstead Hill. With its historic significance and fine view of the harbor, the area became a popular place for citizens to stroll and picnic. 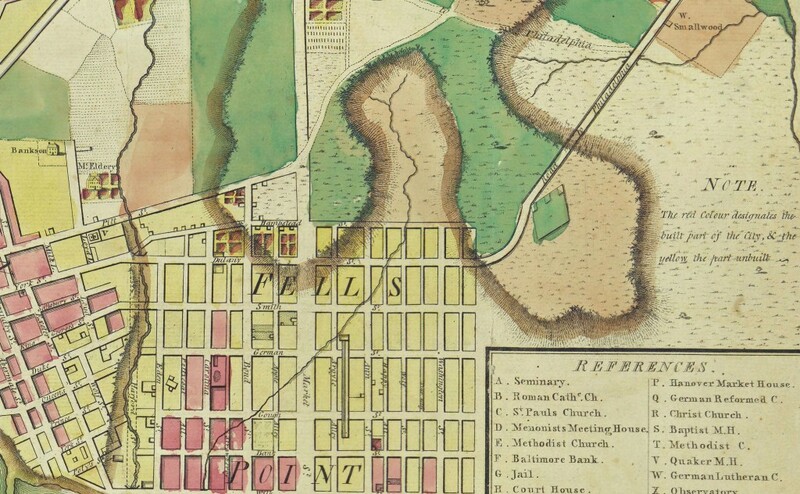 On January 24, 1827, William Patterson wrote to Mayor Jacob Small offering to donate the land to the city to create a public walk like those he had seen on his own travels in Europe. Just a few weeks later, on March 1, the Baltimore City Council passed a resolution accepting the donation and preserving the first six acres of today’s Patterson Park. In 1850, the city purchased another 29 acres from Patterson’s heirs and hired a Keeper to improve and maintain the grounds. Baltimore soon purchased an additional 30 acres of land and continued to improve the park but until 1861 and the start of the Civil War when Union troops chose the site for the location of a military encampment. 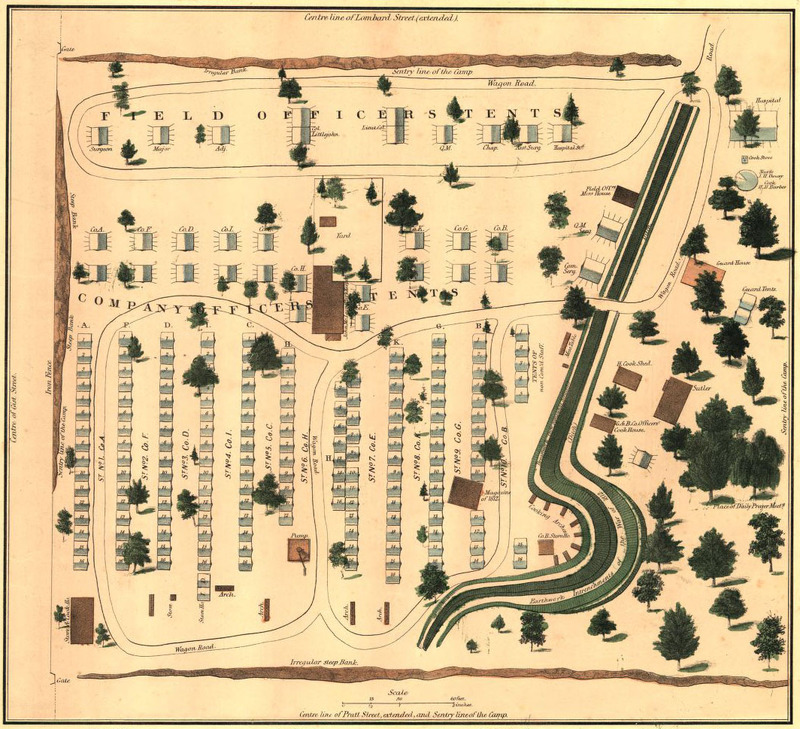 Camp Washburn had the same advantages as a strategic military position in the 1860s of Hampstead Hill in the 1810s. By 1862, the Union camp was converted to a hospital – Camp Patterson Park – until the end of the Civil War in 1864. Camp Patterson Park, 1862. Library of Congress, g3844b cw0256000. Thank you for posting this information about the park. My 2nd great grand-uncle, a first-generation American of Irish immigrants, died in 1864 at the Patterson hospital after suffering wounds at the battle of Spotsylvania Courthouse. That battle was in May, and Pvt. Thomas Hamilton died in September, so he suffered a long time. Grateful that he was a patient near his family in Baltimore. Is there anything remaining from the war of 1812 in the park?